Register Log In wirral forums Forums Ask - Wiki Wirral What is happening next to Central Library? I'm surprised they aren't building luxury apartments? What is it that is being built there? No planning permission applied for as yet, I have reason to believe they were owned by the council so presumably are getting cleared to sell the land. Formally they are being cleared and restored to a "public landscaped area". Last edited by diggingdeeper; 20th Jan 2018 12:04am. There is a decorative bendy path along the middle of it - it looks quite nice. The council has evidently changed its mind. The pretty picture is now unavailable,to me at leat! The pretty picture is now unavailable,to me at leat! £106,000 (over 4 man-years of median UK household income) is a joke but no doubt it comes from funds that they cannot spend on any projects not of this nature. Should have given the job to Fish! Last edited by diggingdeeper; 20th Jan 2018 5:43pm. and poop without a scoop. The money could be from ERD fund, MDC, NWDA HCA, ect. or petty cash. The idea that money is ring fenced and can only be used for Councillors tea fund or wasted in any way is wrong. It presumably covers materials for paths pavements etc, drainage as well as plants and planting, topsoil, hire of machinery, and wages for those working there. It is a big improvement on the crumbling row of buildings that were there before. Well worth it to have the place looking a bit better if you ask me, and certainly better to look at than another bloody block of flats. It would be nicer if they made it into something functional, £106,000 for little more than a dog toilet is pathetic. Why not just flatten and grass over? Better still would be the council not letting OUR assets get the into state those buildings got into. Far too often they waste money by not making things sustainable, I know that is partly Governments' (EU and UK) fault with the silly system of disproportionate amount of grants instead of budgets. 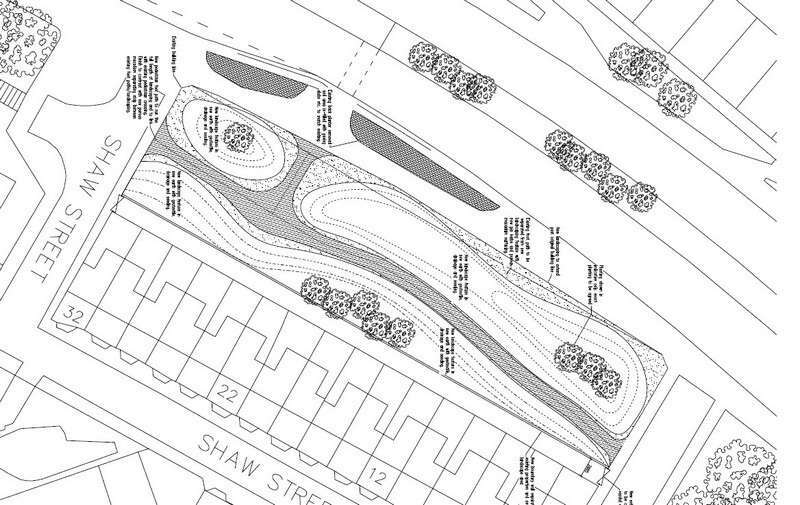 Have a look at something similar across from the new still to open lidl or further along Borough Road towards the tunnel, or half a dozen other places.I agree with DD demolish and grass it over.The path leads from pavement to pavement for no obvious reason.It looks stupid and it is stupid. They should of paved the lot with the flagstones taken up from my road replaced with tarmac .We now have sidewalks.What did they do with the hundreds of paving flagstones.?? Natural ground is uneven, pavements are hardly worse. That's what happens when you use contractors. They're paying £106K for this because they are terrible at handling money - all of their debts are due to crappy deals and just scooping whatever out of the coffers. It took two men three days to put a new (quite big) driveway in at my folk's house, why can't this logic apply to this - if there is a single person having a rest looking at facebook on the digger, something is wrong. I like what they're doing, but this takes the piss. - and a few other sites giving indications of the cost of landscaping, this isn't a bad price at all. I'm sure you can get a number of dodgy builders that would have done a far worse job for far less or gone bust with the cash, but I think its better to use a reliable contractor. I expect there were several tenders for the work and this was the least costly. I'm no defender of the Council. They have a number of idiotic and monumental failures under their belts such as the £250,000 they wasted on their attempt to construct a cyclone centred on Birkenhead Docks, and falling for the great Chinese Trade Centre con, but this doesn't seem to be one of these. But that website is domestic rates for small areas done quickly (turfed), commercial rates for a larger area and seeded instead of turfed should be a lot cheaper. Last edited by diggingdeeper; 22nd Jan 2018 5:04pm.